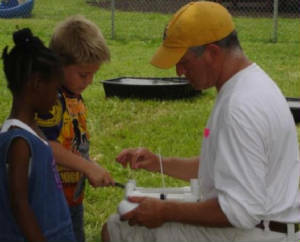 Build-a-Buoy – Entering the classroom (as young as kindergarten) I exclaim that the world record for a small buoy holding golf balls is 15. “Can you guys help me break this record”… students of all ages (K-Gray) lean forward with anticipation and interest. 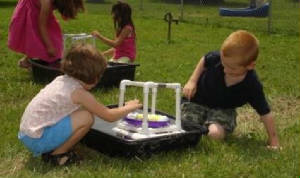 We take PVC pieces and build floats and structures with platforms (Frisbees ™). Implicit in the design is the fact that these platforms need to hold “rolly polly” heavy golf balls. Through the course of the time period, students build their buoy designs, test them in portable basins, and drop balls onto their platforms. Invariably, someone in the group discovers that there is a correct way to orient the platform and that there is a benefit to a lower center of gravity, the lower the better. By the program’s end the record is invariably broken. Students go and share that they broke a worlds record that day. After the buoys have been built, the participants are issued an indoor/outdoor thermometer to install on their buoy. The outdoor sensor is dropped in the water. The buoy is able to record air temperature and water temperature. This transforms the buoy into an observation buoy. Students as young as kindergarten walk away from the program knowing that there are two types of buoys, one that marks underwater roads and another that collects data. Give me a call or drop me a note if you'd like to talk about this program.